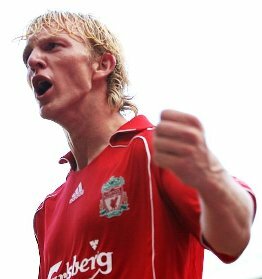 Paul Tomkins on Dirk Kuyt - LFChistory - Stats galore for Liverpool FC! • An in-depth analysis of the 2008/09 season, with both anecdotal and original statistical analysis of the entire Liverpool squad. How did the team perform with certain players in the side? Whose absence was most keenly felt? who contributed most in the big games? Many more relevant questions are answered and much more. Beyond anything else, it is an examination of what the Reds have to do to land a 19th title in the near future. For all his supposed shortcomings, and lingering critics, Dirk Kuyt is absolutely critical to the way Liverpool play. But better than Ronaldo during 2008/09? Quite possibly so. Kuyt works hard, both in and out of possession; he is clever, with good game intelligence, if not overtly blessed with skill; he is versatile, meaning he can move about the pitch and perform to a high standard as the game ebbs and flows; and his control, while occasionally sloppy, is very underrated. Perhaps he has to concentrate on his control more than other players, but for the most part he deals with balls whipped to the wing with aplomb. Where his control isn’t quite good enough at times is when he has his back to goal as a centre-forward, when even the slightest lapse in control allows one of three opponents –– either one of the centre backs or the holding midfielder –– to steal it away. Crucially, given the role he now plays, he can deliver real quality into the box. He may not beat his man to get the delivery in, but David Beckham was a master at just delivering the ball without bothering to attempt tricks; it’s the ball needs to beat the man, after all. Kuyt’s delivery isn’t as good as Beckham’s, but he has a centre-forward’s knack of knowing where the man in the middle wants the ball. Above all else, he never gives up. And that is vital; better players will throw in the towel and not deliver when the chips are down, but not the Dutchman. He is a man of substance, not a prima donna. It was no coincidence that he was involved in many of the late escapes seen throughout the campaign. Gary McAllister noted that "Dirk Kuyt is a player who is not as pure on the eye as some but he’s had a fantastic season." Kuyt’s value was never more apparent than last season, when he finished as the league’s 6th-top scorer, and it’s 6th-top official assist-maker, with not one single winger ahead of him in this latter category. Given that he doesn’t take corners or free-kicks, which helped other players rack up assists, or indeed take penalties, which boosted the tallies of the players ahead of him in the scoring chart, that’s a great contribution, even before considering his work-rate and general team ethic. While Ronaldo outscored Kuyt, he would not have done so without the aid of set pieces. Of course, he deserves great credit for the way he takes free-kicks, with incredible swerve; the Dutchman certainly couldn’t match him in that respect. But free-kicks and penalties can be taken by players who make no other effort in the match. And when it comes to penalties, Kuyt has a 100% record for the club, including some of the most high-pressure kicks imaginable (Champions League semi-final shootout, plus two vital ones away at Everton, including a last-minute spot-kick to win the game). Kuyt has to defer to Gerrard and Alonso, but if he didn’t –– and it’s not due to his own deficiencies –– he could quite realistically have ended up with 23-25 goals this season, just shy of Ronaldo’s tally. From open play, Kuyt scored more goals than Ronaldo. He also directly created more for others. And he worked harder than the Portuguese, by some distance. Both scored important goals, but Kuyt really delivered at crucial times in crucial matches throughout the season, not just in the run-in. Vitally, Kuyt lifted those around him by the example he set. The Daily Mail’s Martin Samuel, one of the few enlightened journalists on the subject, wrote (in a piece that related to the way England now want to play) in March 2009 that "[Kuyt] … is the changing face of modern football. The striker comes out of the space and the midfield and wide players flood into it. What Capello wants from his wide forward, Kuyt has been doing for years now, often to little credit. His work ethic, unselfishness and ability to operate in a netherworld between the touchline, forward line and midfield make him the epitome of the modern attacker. Kuyt will never have an FA Cup final named after him like Gerrard or draw comparisons with Pele as Rooney did in Portugal but at the top of his game for Liverpool, pound for pound, he continues to punch his weight against the best of them. He knows what his manager wants and he delivers it without ego or introspection." It might not make him worth £80m, but to Liverpool at least, Dirk Kuyt remains priceless.